I think it’s not necessary to tell you over and over again how much I liked Lisbon and what an amazing city it is and so on and so on. Just one thing: go go go, visit it, have a great time, safe a lot of money because it’s cheap (I’m speaking of 10€ for a pretty good hostel bed and 9 for a perfect three-course-menu), it’s laid-back, it’s young and creative, and beautiful and busy and not too big but big enough. And so close to Europe’s most beautiful beaches. And after booking your flights takes notes and follow this little guide around one of my favourite cities. 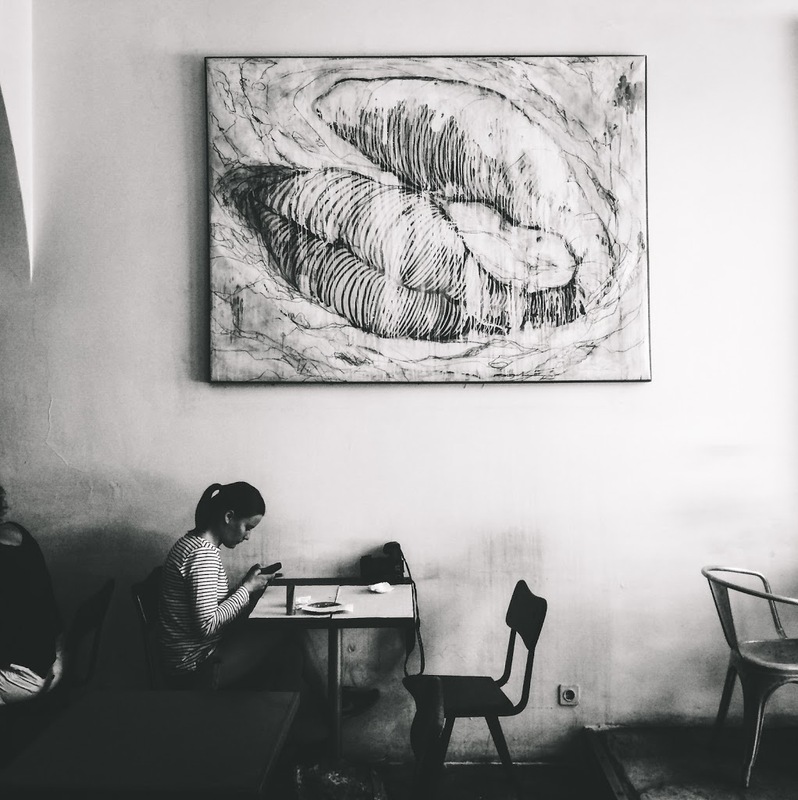 Perfectly located in the middle of the young and buzzing Bairro Alto Passport Hostel was our home away from home. As cheesy as it sounds, it describes pretty well how good it felt every time we walked up the narrow staircase to the hostel entrance. The staff and people we met were super lovely, the bathrooms and dorms super clean and breakfast was served in the attic. After a few days in the south of Portugal we came back to Passport Hostel and it felt like it’s been three months of travelling. As much as the name makes it sounds like we went to a Dutch restaurant while being in Lisbon we actually had some pretty good portuguese food there. The café/restaurant/lunch place pretty much saved us after a short night, an early flight and many hours of walking through the streets of the Alfama, with unexpected 30 degrees and increasing desire for a shadowy, laid-back place to spend a nice long lunch break. 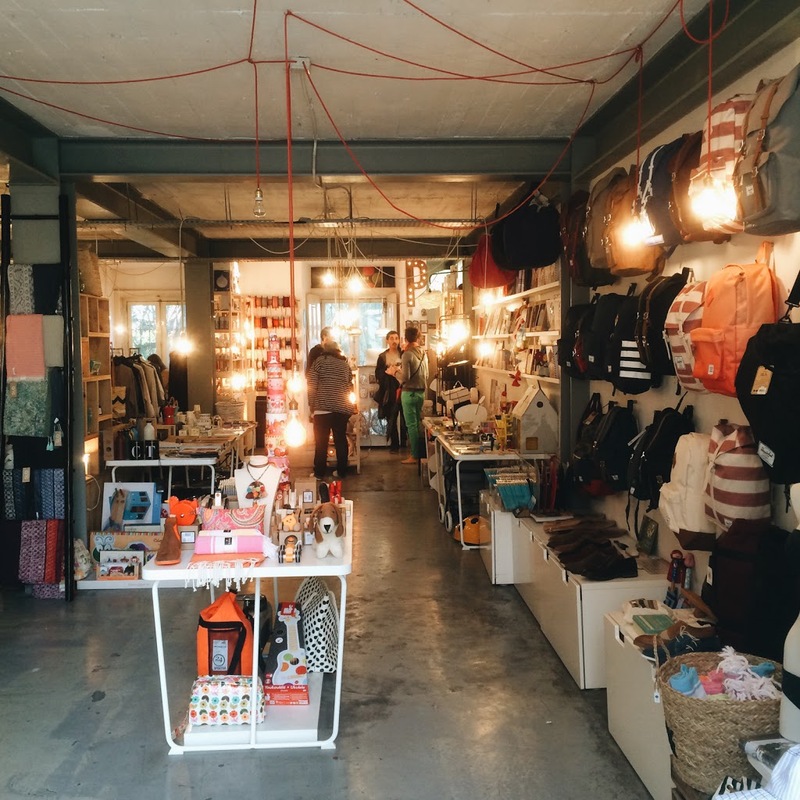 We spent a lot – a lot – of time walking through the beautiful Bairro Alto, discovering little shops and bars and getting some of the best views on Lisbon. One of the nicest squares in the neighbourhood is located in front of the small park “Jardim do Príncipe Real”, close to the botanical garden. All around the square we found super nice indoor markets, placed in beautiful palace-like houses, featuring local fashion and accessories, perfumes, oils, food, sandals, sunglasses and much more fancy stuff for which you would love to have some extra money to spend on. I can’t remember all the names but one worth visiting was called Entre Tanto and several other ones were just next door. Even though nothing beats Portugal’s most popular pastry, the “Pasteis de Nata”, at some point you might feel like you’ve had enough vanilla pudding for a while. 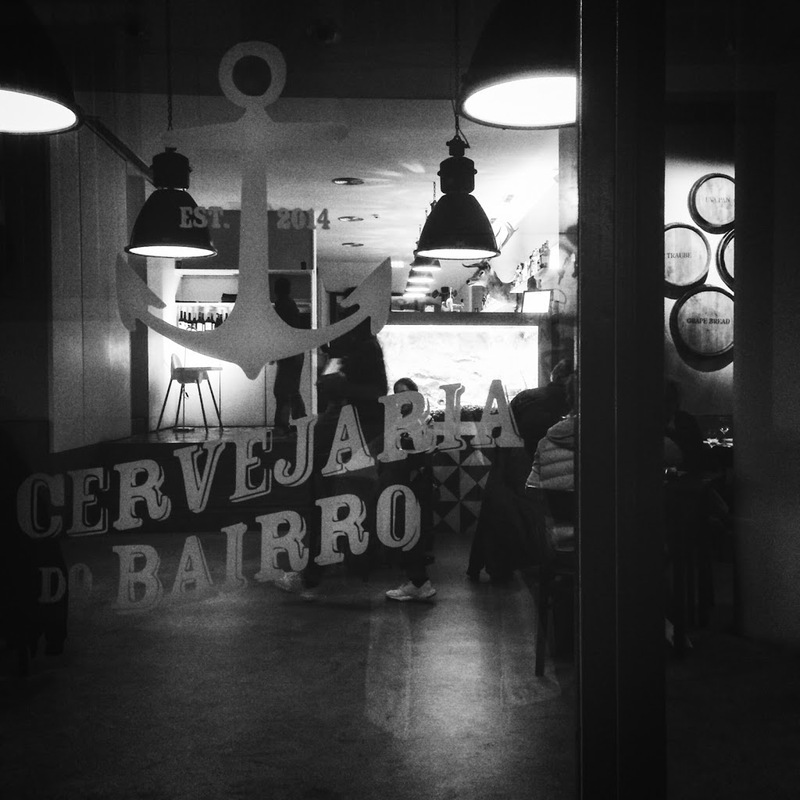 At least that’s what happened to us – it didn’t last for long though but we were more than happy finding this super cute little burger place in the Bairro Alto. Cheap and really really good (vegan) burger, salads, fries, and that’s about it but really, all you need after hours of walking up and down the hills of Lisbon. We had a lot of picnics and cheap snacks during our journey but the last night we really felt like eating some really good fish in a (sort of) fancy restaurant. Even though it was a bit touristy the Cevejaria do Bairro was just what we needed: a cosy yet clean restaurant, some locals, some tourists, a bit fancy but not too much, a bit more expensive but still cheaper than a sandwich in Paris, serving some really good grilled salmon and not so good but free port wine. I remembered visiting the botanical garden of Lisbon some years ago and I also remember how I definitely did not enjoy it as much as I did this time (maybe because we weren’t dragged into it by my flower-loving mom but actually felt like we needed some nature around us). 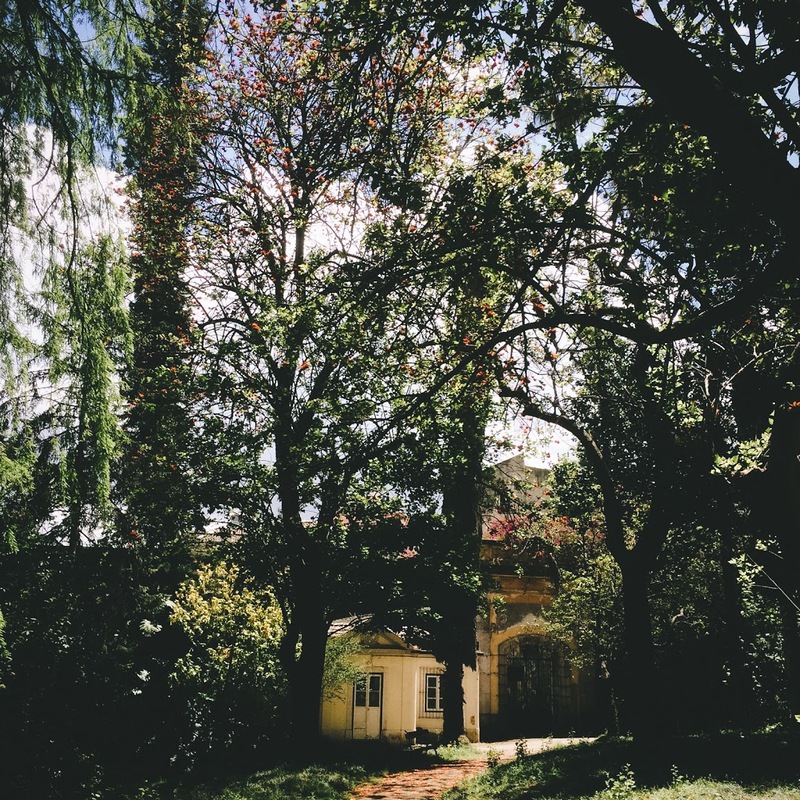 It’s such a beautiful place in the middle of the city and sitting under the massive trees, listening to the birds and watching butterflies easily makes you forge the hot and dusty streets which are on the other side of the high fences. Tipp: take your picnic with you and have a perfect lunchbreak in the middle of the green . Most likely the most visited neighbourhood in Lisbon the Alfama is still super worth visiting. Take comfy shoes, a big water bottle and a lot of time and you can spend hours wandering up and down the streets and alleys around the big castle which sits on top of the hill. 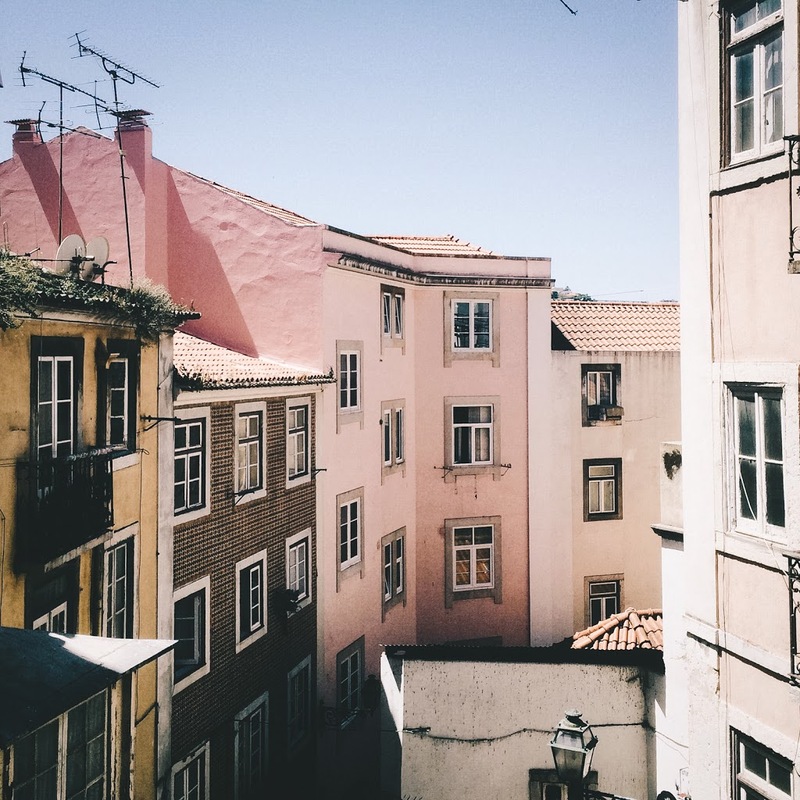 The houses are pastel pink and yellow and baby blue and covered in the most beautiful tiles, you can find hidden street art and backyard restaurants and the most peaceful little squares you could imagine in a city like Lisbon. Our first day in Lisbon was super hot and started super early and so we were kind of tired by the end of the afternoon. 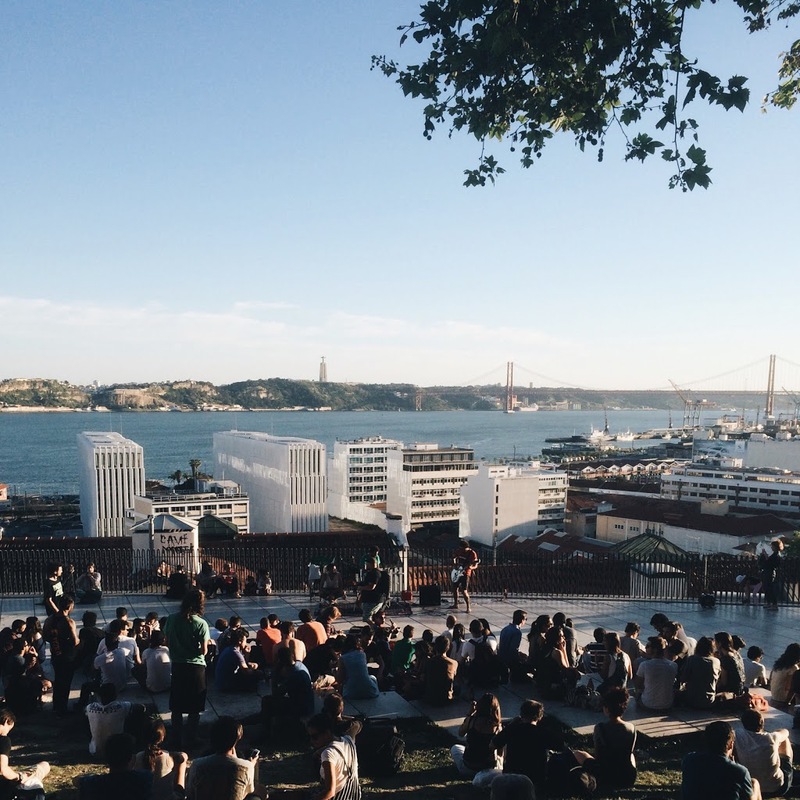 Even though we didn’t feel like experiencing Lisbon’s night life that day we luckily found this amazing terraces overlooking the Tejo. Some bands were playing, the place was packed with all sorts of people and it just felt so good to sit down for a while, enjoy the warm summer evening and southern European atmosphere and celebrate the first day of our journey. Not sure if these concerts are happening regularly but it’s worth giving it a try, even if it’s just for the beautiful view over the city. 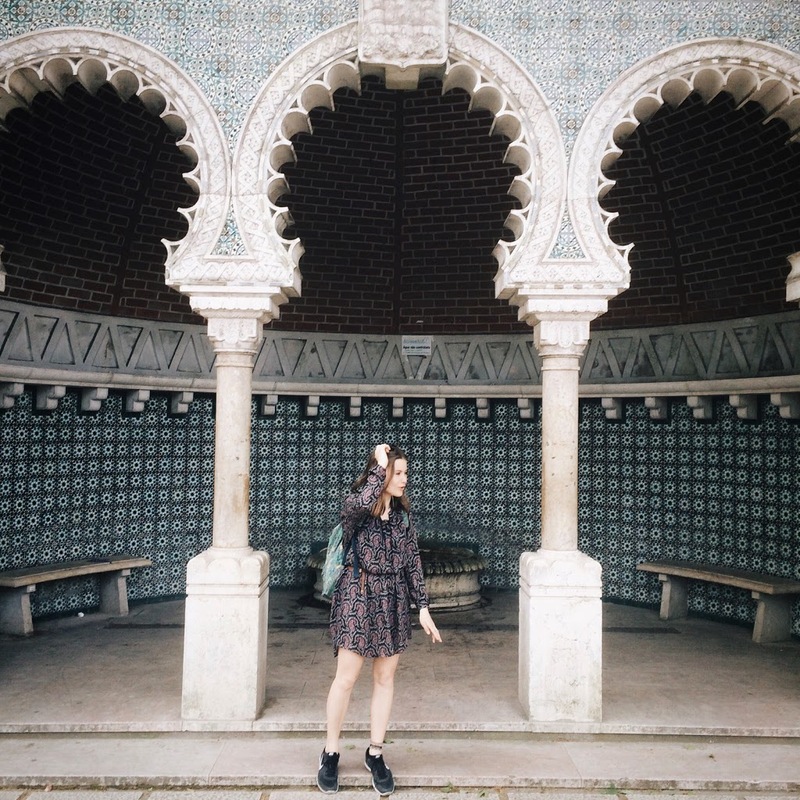 A trip to Sintra is pretty much mandatory when visiting Lisbon and considering how cheap and short the train ride is it’s definitely worth half a day trip. 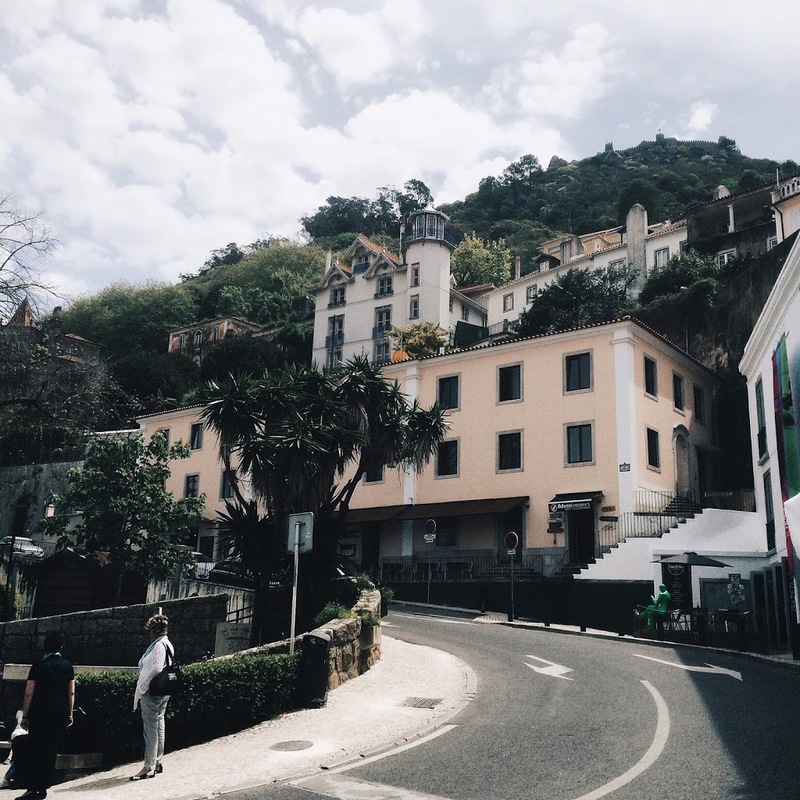 Come early enough to avoid the masses of tourists arriving around lunchtime, get a round bus ticket, walk through the beautiful park and enjoy some ice cream in the unbelievably pittoresque village of Sintra before taking the train back to the city. 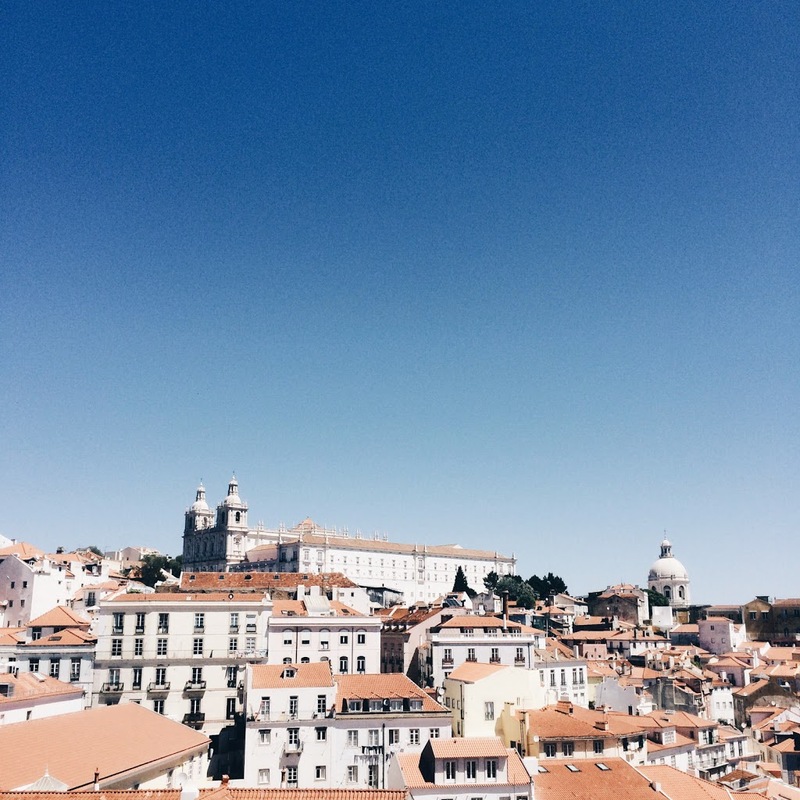 This is just a small collection of nice places to visit in Lisbon but there is one tip for sure: just go, walk around for hours which is pretty much unavoidable, explore all the cute alleys and squares and cafés and bars, viewpoints, restaurants, galleries, shops and so much more. Lisbon is big enough to be as exhausted as you’re supposed to be for a city trip but small enough to discover the city (or at least the center) by foot. Bei deinen Bildern steigt meine Vorfreude noch mehr, die Stadt bald mit eigenen Augen zu sehen 🙂 wirklich schön! I only spent one day in Lisbon thanks to a missed flight, and everyday I look forward to going back. It left such a beautiful impression on me and your photos definitely help!